Juicing is not a new concept, but it is one that is becoming trendy yet again. The modern idea of juicing for health and wellness actually dates back to the 1930s and the Norman Juicing Press. Norman Walker was a proponent of raw food diets nearly 80 years ago. A more modern version of the juicer developed in the 1950s, and of course, there was Jack LaLanne, fitness fanatic and juice devotee, who sold his juicer on TV for decades. So, why do we keep coming back to juicing as a health craze? Probably because anything that gets us to eat more fruits and vegetables is a good thing. You can buy juice at the store, but to juice your own fruits and vegetables at home, the healthier option, you need to use a juicer or an extractor. This is a machine that extracts the juice from your produce. A blender, which chops up fruits and vegetables very finely, is not the same thing and will not extract juice. The juice of a fruit or vegetable contains all of the minerals, vitamins, and other chemicals, sometimes called phytonutrients, present in the whole piece of produce. What does not make it into the juice is the bulk of the plant, or the fiber. Fresh juice that you make at home also lacks the preservatives and added sugar (which contributes heavily to the calorie count) that you find in many store-bought juices. Smoothies are similar to juices in that they allow you to get a drinkable form of your fruits and vegetables. Instead of extracting the juice from produce, however, when making a smoothie, you put the whole fruit or vegetable in the mix. Smoothies are generally made in a blender, which chops up your food into very small pieces. A food processor can do the same thing. A big difference between a juice and a smoothie is texture and consistency. Smoothies have more texture and are thicker than juices. You also can, and most people do, include more varied ingredients in smoothies. Juices are typically made from one type of fruit or vegetable or a mix of a few. Smoothies, in addition to the produce, also often include nuts or seeds, dairy or superfoods, and sweeteners. Many people turn to juicing or smoothie diets as a way to lose weight. A popular trend that comes back into style time and time again is a juice cleanse. This means drinking fresh juices, and eating little or no solid food, for a period of time to cleanse the digestive tract and to help kick start weight loss. Some people do this with smoothies as well. In terms of calories, smoothies often have more than juice, but it really depends on the ingredients. By not planning well, you can make both a juice and a smoothie that has more calories than you want. To lose weight with either smoothies or juicing requires planning and effort. There is no magic fix. As for which may be better, it really depends on your plan. Juices can be loaded with sugar if you use too many fruits and not enough vegetables. Smoothies are typically better at keeping you feeling full, and if made thoughtfully, can include enough macronutrients, like proteins, carbohydrates, fats, and fiber, to replace meals. Drinking juice alone may help you lose weight in the short term, but you cannot live on juice forever. One of the best reasons to consider including either juicing or smoothies, or both, in your daily routine is to get more nutrients. For most people, the recommended servings of fruits and vegetables each day is not easy to achieve. Many people simply don’t like to eat them, while for others the challenge is just finding the time to buy and prepare vegetables and fruits before they go bad. By juicing you can use your produce quickly before it goes bad and cram more into your daily diet. Of course, the same is true with smoothies, but there is another added benefit to juicing those veggies: nutrient absorption. Because juicing breaks down the fruit and vegetables for you, so that the vitamins and minerals they harbor are easier to access, or so they say. It might be true, but there is actually no evidence that you get more nutrients out of juice than the whole fruit, so convenience might be the biggest reason to use juice to eat more fruit. While juicing your fruits and veggies may or may not help you get more vitamins, minerals, and nutrients by breaking them down for you, there is one proven advantage to processing them in this way. If you have difficulty digesting whole produce, because of a digestive disorder or just a sensitive stomach, juice can help you get fruits and veggies more easily. Because you are breaking them down before you consume them, the produce in your juices are easier to digest. A major and important difference between juicing and smoothies is fiber content. Fiber is the material that makes up the bulk of fruits and vegetables. When you juice, you pull out all the other nutrients from the fruit or vegetable. What gets left behind is the fiber. Fiber is a necessary nutrient and one that helps you in many ways. Fiber keeps your digestive track healthy and running smoothly and with regularity. It helps to lower cholesterol levels, and controls your blood sugar. Fiber is also an important part of maintaining a healthy weight because it fills you up without adding calories. Juicing removes the fiber, but smoothies do not. This is one great advantage of the smoothie over juice, but it does not mean you can’t still get the benefits of juicing. Some juicing machines have a special attachment for collecting the pulp and fiber from the vegetables and fruits you juice. You can keep that pulp and use in other recipes. Fruit pulp works well in baked goods, like muffins, while vegetable fiber can be used in soups and stews. One final consideration to make when deciding between juicing and making smoothies is the necessary equipment. To make a smoothie you need a good blender that will get you the consistency you want with little effort. To make juices, you need a juicing machine. A blender or food processor cannot extract juice. In terms of price, you will pay more for a good juicer than for a good blender. Whether you choose to make juice or smoothies, or both, to get the maximum benefit it is important to consider how you make them and use them. When making juices and smoothies use a variety of fruits and vegetables to get the maximum nutrients. Different types of produce have different vitamins, minerals, antioxidants, and other beneficial nutrients, so diversify. If you are hoping to lose or maintain weight, stay away from high-calorie ingredients. When making smoothies it can be especially easy to go overboard and add in too many calorie-dense foods like milk, ice cream, and sweeteners. With juices, too many fruits and not enough vegetables can take your calorie count up too high. Another consideration is how you use your juices and smoothies. Although many people tout the benefits of going through a juice cleanse, there is little evidence that it does much for your health. And, many doctors would caution against subsisting on juice alone. You cannot get all the nutrients you need from juice. With smoothies, on the other hand, it is possible to get all your nutrients, like protein, fats, and carbohydrates, as long as you plan your recipes carefully. Juices and smoothies each have their benefits and their downsides, but when made correctly and integrated thoughtfully into your diet, both can add nutrition and help you lose or maintain weight. Arm yourself with the right information about crafting wholesome smoothies and juices and reap the wonderful health benefits. For the truly adventurous and health conscious, use fresh juice as the liquid in your smoothie. This takes more time, but the result is one healthy, nutrient dense beverage. While my site is dedicated to smoothies, I do have a few juice recipes, check them out here: fresh juice recipes. 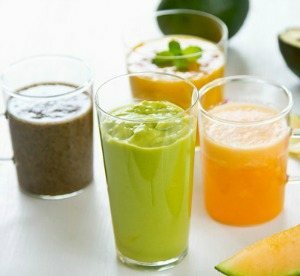 What are your thoughts on juicing and smoothies, and which have you experienced health benefits from? 7 Responses to Smoothies vs Juicing: Which is Better? I consume both and feel they each have their own place in a nutritious diet, but verity is key! As mentioned above it is very important to remember that adding too much fruit to either can affect insulin levels and is not optimal for weight loss. I personally like to make a smoothie on the go in the mornings or after a workout. I typically juice as a “meal enhancer” or snack making a green juice thirty minutes before I have lunch or sometimes in the afternoon as a vitamin filled pick me up! One of my favorite juices consists of the following: 4-6 celery stalks, 1 small green apple (core removed), 1 lemon (peal removed), and roughly 1” of fresh ginger root. When juicing it is important to drink it as soon as it is made to optimize the nutritional content, also drinking it on an empty stomach allows for better absorption. You’re juice recipe is right up my alley. I would add one ingredient, kale, to round out a nice green vitamin and mineral packed juice. Are there any analysis done comparing the content of the whole vegetable to the juice? There’s definitely a big difference, Luke. Fiber being the most notable thing missing from the juice. I juice less and less these days as I prefer to get the whole vegetable in the form nature intended. However, a fresh green juice every once and a while is refreshing. Happy found your site, fountain of knowledge. But didn’t find the straight answer to one question: how long can I keep my smoothie? Can I do it in advance at night and just grub it with me to work, considering I have no time in the morning. Yes, a lot of people make their smoothie the night before. It will keep refrigerated for about 24 hours and frozen for a couple of weeks. You may want to experiment with refrigerating or freezing. You’ll likely need to give it a good shake to redistribute and hopefully maintain the consistency of a fresh smoothie.